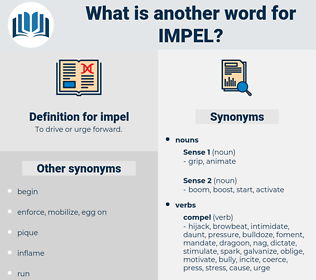 What is another word for impel? To drive or urge forward. bringing pressure bear up on. holding a gun to ones head. 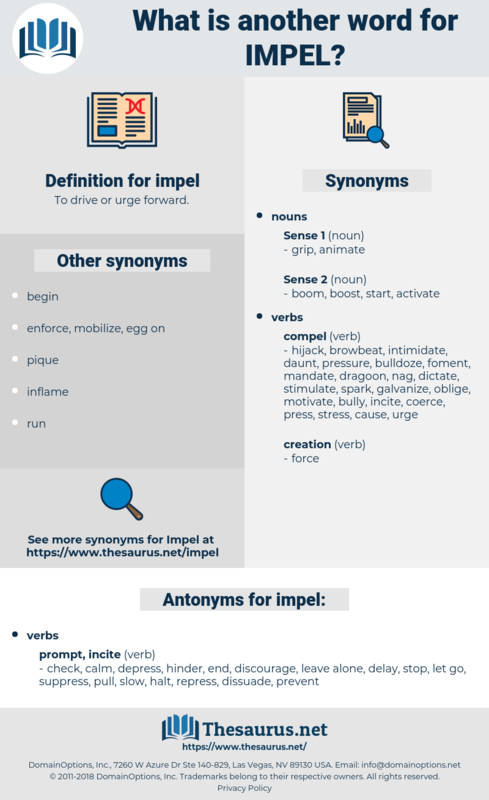 propel, compel, motivate, encourage, prompt, induce, stimulate, spur, inspire. check, calm, depress, hinder, end, discourage, leave alone, delay, stop, let go, suppress, pull, slow, halt, repress, dissuade, prevent. After several days had elapsed Mr. Foote considered his duty, and interpreted it to impel him to call in person upon his son - clothed in dignity and with the demeanor of outraged parenthood. They come to us not only as a race heritage, but they impel us to activities which are immediately useful, or else prepare us for the later battles of life.